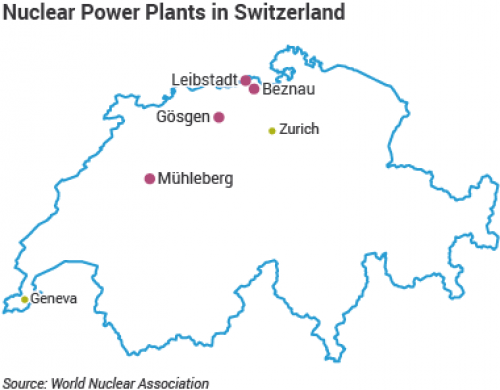 In a referendum held on May 21, Switzerland voted in favour of revision to the country's energy policy that prohibits construction of new nuclear power plants and promotes the use of renewable energy sources and energy conservation. In a vote, 58.2 per cent of Swiss citizens voted in support of the revisions to the Energy Act. 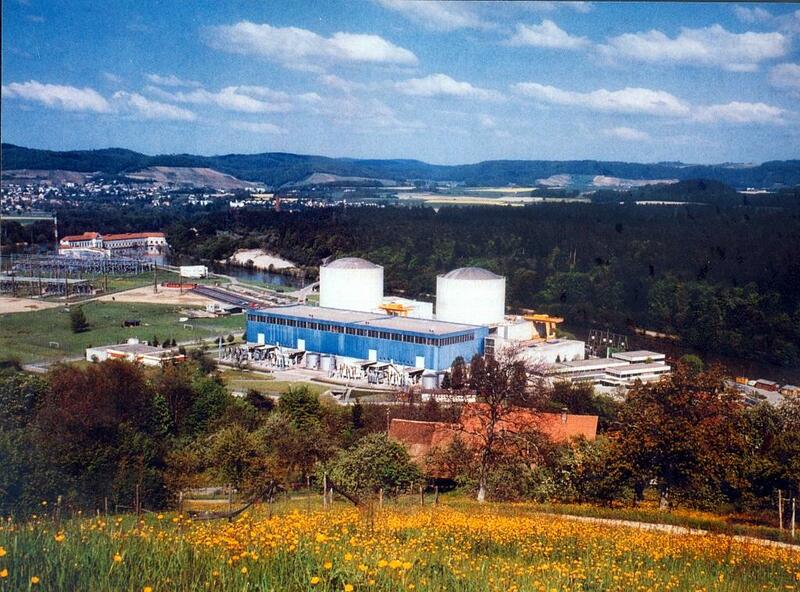 A new Swiss energy policy was sought in response to March 2011 accident at the Fukushima Daiichi plant in Japan. In June 2011, the parliament unanimously decided not to replace any reactors and phase out nuclear power by 2034, despite strong public support for nuclear power. Under the revised energy law, no construction licences will be issued for new nuclear power reactors and no "basic changes" to existing nuclear power plants will be permitted. According to the Department of the Environment, Transport, Energy and Communication, the revised Energy Act is expected to come into force in the beginning of 2018. 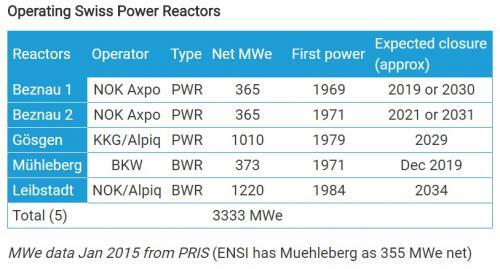 Currently, Switzerland has five ageing nuclear power plants, which provide one-third of the country's energy needs. These plants will be allowed to remain in operation as long as the Federal Nuclear Safety Inspectorate considers them safe to do so. However, the first nuclear power plant, which started operating in 1957, is earmarked for closure in 2019. 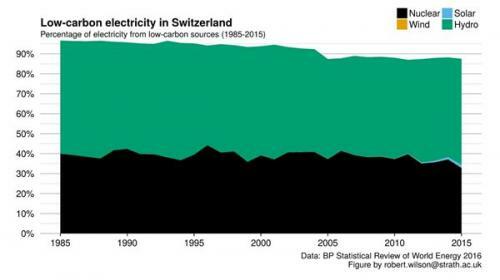 Electricity consumption in Switzerland has been growing at about two per cent year since 1980. In 2015, total electricity production was 67.5 terawatt-hours (TWh), with nuclear power contributing 23 TWh (34 per cent) and hydropower supplying 59 per cent of the total energy output. The gradual withdrawal from nuclear energy, as envisioned in revised energy plan, would cost an average family about £31.64 (US$35.57) more a year because of a higher grid surcharge that would help in funding renewable subsidies. While the Energy Strategy 2050 initiative—designed by the Federal Council—calls for a gradual withdrawal from nuclear energy, it predicts expanded use of renewables and hydropower and increased reliance on fossil fuels and electricity imports as an interim measure. Under the Energy Strategy 2050, $494 million will be raised each year from electricity consumers to fund investment in wind, solar and hydropower. Power generation from solar, wind, biomass and geothermal sources will increase from 2,831 GWh to 11,400 GWh by 2035. An additional $450 million will also be set aside from the existing tax on fossil fuels to help reduce energy consumption in buildings by 43 per cent by 2035 when compared with 2000 levels. The Energy Strategy 2050 also extends a moratorium on the export of used fuel for reprocessing indefinitely. What’s derailing growth of solar energy in some US states?